PowerPop - A soulful blend of past and present PowerPop and Rock influences. 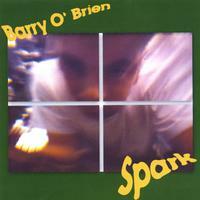 Barry O'Brien is a Dublin based solo artist who's debut EP "Spark" is a soulful blend of past and present Powerpop and Rock influences. It also contains the beautiful acoustic ballad "Sisters in the Sky"which recalls the melancholic feel of both Nick Drake and Elliot Smith. The song was also used in a recent short film by Director/ Writer Patrick Thornton, called "Monster" in which Barry had a cameo role. Born and raised in Dublin, he was brought up with the influence of his big brothers' record collection. He was inspired to take up guitar at the age of twelve and played with various bands until he attended Ballyfermot Music College. Eventually forming the band "Peyote" he enjoyed success on the Irish gig circuit. When Peyote went their separate ways, Barry took a different route by taking up singing and immersing himself in the craft of songwriting. Playing at various clubs around the city to develop his songs, he bought himself a 4-track recorder and formed his own band consisting of members from Mundy, Pugwash, Halite and Las Vegas Basement. Barry continues to tour and record for his forthcoming debut album. Barry O'Brien's tunes have more hooks then a fisherman's tacklebox. We drop the great Jason Falkner`s name here quite a bit as he`s an incredibly important and influential musician. Despite that flow of his name from these parts, rare in the band, the musician who can truly pull of sounding "like" Jason. Barry O`Brien *does*. O`Brien has that ability to write a sweeping, pumping pop melody that drives home its point hard but never losing the sweet effect. It can be lush and edgy ---- and crunchy, topped with a sugary-grit. These songs are effortless and elegant. He has nice use of key changes and tempo changes with simple melody lines, examples of true artistry. Who is this mystery melody man, strolling through the park tossing out pocketfuls of shiny links and segues while singing fervently and flawlessly like it`s second nature? Just when you think you`ve grabbed a chord it takes a tricky turn, just out of reach. Well, Barry O`Brien pulls it in. Shame it`s an EP, of course....but this `course` will do just fine. Very, Very Fine. Grade: A-. Because "Spark" is head and shoulders above the sort of thing you usually asociate with an unsigned artist. The songwriting is sublime, the sound is urgent and fully realised and - while comparisons do raise their heads above the parapet - Barry stamps his presence all over these four beautifully-executed tunes. "Cut Me Out" is the opening salvo and it soon establishes itself as dreamy, melancholic pop with a tinge of Mercury Rev in the guitar department and a languid, yearning vocal from Barry carrying the melody along. It's a haunting, chromaticically-inclined beauty and the occasional coating of ear candy (such as the weird, analogue synth) only serves to make the recipe more attractive. Corking start and it's anything but downhill from there on in. Announcing itself with a maniacally souped-up intro, "The Strangest Game" has garnered a number of Elvis Costello comparisons and while that's undeniable, it's still a prime slice of funeful, new wave aggro that (to these battered ears) also recalls Graham Parker at his toughest and adds the sort of weird, cooing mini-korg sound Ric Ocasek used to slip into the early Cars records. "Sisters In The Sky," by way of a contrast, showcases a softer, acoustic approach to Barry's oeuvre and here his love of Elliott Smith quietly leaks out. Having said that. it's also the kind of sadness-tainted beauty Andy Partridge excels at and with (I think) a mellotron filling in some extra colour, it has a lovely reflective feel. He finishes up with "Under The Waves" which is possibly the catchiest of the quartet. This time, the ghost of XTC again hovers with the brisk, staccato riffing, but with drummer Aidan O'Grady supplying muscle and invention and bassist/ producer Keith Farrell inserting some Bruce Thomas-style counterpoint punctuations, it soon transcends the sum of its' parts and comes on like unashamedly timeless power pop of the first water. The time-honoured singer/ songwriter stakes is a hotly-contested steeplechase and many of the runners and riders fall at early hurdles. However, compared to the much-vaunted quirky Dublin-based contenders such as Damien Rice (intriguing) and David Kitt (woefully over-rated), Barry O'Brien is a breath of fresh air and a man who knows intrinsically how to cut to the chase of a powerful pop song. From first listen, I was lured with a sound resembling that of Duncan Sheik's electric guitar god, Jerry Leonard. "Cut Me Out" is a brilliant song about not caring when you're cut out of someone's life. If "Garden State" were a mellow film about anger, this song would have fit perfectly on the soundtrack due to its dreamy nature and alluring background noises. This album has an upbeat sound with some dark messages, but it was a professionally sounding rock-and-roll album that stood out to me. The only bad thing is that the rest of the tracks don't measure up to the first one. Still, there was a great Beatlesque, indie quality that appealed to me. smooth on the exterior, rough on the interior. dublin based barry o'brien spills his guts into a melodic rock gem from overseas. In sum, my guess is if you gave this a spin for Sir Paul, he'd nod and grin and bob his head to the beat. It doesn't get much better than that. "Spark" is a bright flash of power pop brilliance. "Spark" is a bright flash of Power Pop brilliance. From the bouncy, horn-riddled pop of "Under The Waves" to the lushly perfect harmonies and guitar of "Sisters in the Sky", Barry O'Brien delivers a classic 4-song EP. "The Strangest Game" is a driving rocker that sounds much like something that could have been recorded by Jason Falkner or Brendan Benson while "Cut Me Out" is a breezy mellow blend of Morrissey and The Churchills. Let's home this EP "sparks" a flaming long-playing release very soon! Featured Tracks: "Under The Waves", "The Strangest Game"
smooth on the exterior, rough on the interior. dublin based barry o'brien spills his guts into a meldoic rock gem from overseas. Great E.P. with finely crafted tunes. Just a great 4 song E.P. Obviously a great writer and talent. Can't wait for more.